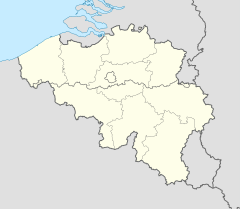 The location of Engis within Belgium. The 1930 Meuse Valley fog killed 60 people in Belgium due to a combination of industrial air pollution and climatic conditions in December that year. The Meuse river flows from France, through Belgium and the Netherlands before entering the North Sea. The area in the Meuse Valley where the incident occurred is densely populated as well as having many factories. There were several thousand cases of illness over the period of two or three days with the sixty deaths occurring at the same time. Fifty six of the deaths were to the east of Engis. The main symptom was dyspnea (shortness of breath) and the average age of those who died was 62, over a range of ages of 20 to 89 years. Cattle in the area were also affected. Kaj Roholm, Danish scientist and world's leading authority on fluorine, determined that it was the fluorine gas from the nearby factories that was the killer. The exact date for this disaster is unknown. A statue and plaque commemorating those who died was inaugurated in Engis on 2 December 2000. ^ a b Roholm, K. (1937). "The fog disaster in the Meuse Valley, 1930: A fluorine intoxication". J. Ind. Hyg. Toxicol. 19 (3): 126–137. ^ a b Nemery, Benoit; Peter HM Hoet, Abderrahim Nemmar (2001). "The Meuse Valley fog of 1930: an air pollution disaster". The Lancet. 357 (9257): 704–708. doi:10.1016/S0140-6736(00)04135-0. ISSN 0140-6736. PMID 11247570. ^ Firket, J. (1936). "Fog along the Meuse valley". Transactions of the Faraday Society. 32: 1192. doi:10.1039/TF9363201192. ISSN 0014-7672. ^ K. Roholm, op. cit. This page was last edited on 18 February 2019, at 10:48 (UTC).